We’d love your help. Let us know what’s wrong with this preview of Star Trek by Roberto Orci. From Star Trek 2009 feature film writer/producers Roberto Orci and Alex Kurtzman, and artist David Messina, comes an all-new story set within the events of the hit film! Not an adaptation, this exclusive story follows the villainous Nero as he seeks to destroy the Federation. This continues from Star Trek Countdown and serves as another prequel to the 2009 movie. On its own I didn't like this quite as much as Countdown but it was still worth it to learn more about Nero and the events that lead up to the movie. This one focuses on what happened to Nero after he went through the black hole and what he did for 25 years right up to where the movie starts off. Both of these books together provide a legitimate explanation of exactly why Nero blames the Federation and Spock This continues from Star Trek Countdown and serves as another prequel to the 2009 movie. On its own I didn't like this quite as much as Countdown but it was still worth it to learn more about Nero and the events that lead up to the movie. This one focuses on what happened to Nero after he went through the black hole and what he did for 25 years right up to where the movie starts off. Both of these books together provide a legitimate explanation of exactly why Nero blames the Federation and Spock in particular for the destruction of his home planet, while the movie makes it seem like he blames them just because they were unable to rescue them. You will also learn how a simple miner like Nero turned into a psychopath, how he obtained such a badass ship and (perhaps most importantly) how he acquired the red matter and what it was originally supposed to be used for. Once again, the artists that were behind this are absolutely multi-directional hatching EXPERTS, beautifully utilizing an under-appreciated pen and ink technique for shading. This story, as it is told from the point of view of Nero, and includes a bunch of violent Romulans and even more violent Klingons, is kind of...well...violent. Still, it's worth reading. Once again, loved this comic. This one was especially nice since it filled in the holes of what Nero was doing between his first appearance and when Kirk and company encountered him years later. That was one of those plotholes that bothered me in the movie, so it was nice getting this little story to answer where he was and what he was doing. It was also nice since it fleshed out his character a bit more and gave some more weight to his motivations. He was fine in the movie, but this really help Once again, loved this comic. This one was especially nice since it filled in the holes of what Nero was doing between his first appearance and when Kirk and company encountered him years later. That was one of those plotholes that bothered me in the movie, so it was nice getting this little story to answer where he was and what he was doing. In the movie, Nero came through the black hole 25 years ahead of Spock. What did he do all that time, and how did he come to predict when and where Spock would arrive? This movie answers all that and ties in several other references from the movie. The sentient ship thing from issue 3 is a little weird, but otherwise it's quite good. Spock's perspective towards the end is priceless. Some bloody fighting and a bit of drug use. Recommended reading for fans of the film. This was excellent. This volume along with Star Trek: Countdown contains vital background information to the Star Trek reboot. Whereas Countdown provided background for Spock and Nero in the Next Generation era, this focused on Nero's activities in between his first appearance and his attack on Vulcan 25 years later. You should definitely read Countdown before seeing the movie, but I wouldn't read Star Trek: Nero until after you've seen it. ¿Qué fue de Nero durante los 25 años que esperó a Spock? Pues si queréis saberlo, leedlo. Tiene un guiño a una de las primeras pelis originales de Star Trek y abre un interesante campo con el funcionamiento de la Narada, la nave de Nero. Interesante, aunque como todas estas novelas gráficas, muy corta. Esta historia da para libro. This was a really interesting look at what happened to Nero during those 25 years in the time warp that he was waiting for Spock to come through the worm hole as well. I would recommend reading this BEFORE reading the novel adaptation of the movie, rather than after. Really good and you better understand Nero's anger and hate, as well as his extreme dedication to vengeance. The explanation of Nero's escape from Rura Penthe was one of those only-in-comics situations, but I still liked it. This and the "Countdown" series give Nero some needed depth that unfortunately isn't able to be explored onscreen. I actually wish that this one were longer. Wanted to see a bit more of what happened during the prison years. Love how this tied into Star Trek Into Brightness though. This book will completely change the way that you watch the movie, and make you feel more comfortable with the changes. 47 Klingon ships surround the Narada. Thank you for that. The story is surprisingly fun and a great addition to the movie, especially due to the fact that it explains what leads to Nero's blind hatred and his wanting revenge on Vulcan and on Spock. The Narada, though damaged, has survived travelling through the singularity into the past. Its mission of revenge against the Federation is ongoing. The members of the crew who want to return to Romulus are killed as they leave the ship on shuttles. Th 47 Klingon ships surround the Narada. Thank you for that. The story is surprisingly fun and a great addition to the movie, especially due to the fact that it explains what leads to Nero's blind hatred and his wanting revenge on Vulcan and on Spock. The Narada, though damaged, has survived travelling through the singularity into the past. Its mission of revenge against the Federation is ongoing. The members of the crew who want to return to Romulus are killed as they leave the ship on shuttles. The rest are captured and imprisoned by Klingons. They try to steal the technology on the Narada, but are unsuccessful. (view spoiler)[For 25 years Nero's escape attempts fail until the ship, gaining a mind of its own, breaks them out by itself. It takes Nero and his crew to an unknown location where Nero melds with an entity that resulted from an ancient civilization. The entity called out to the Narada as a kindred spirit. This review has been hidden because it contains spoilers. To view it, click here. In this comic, you learn what Nero did in the 25 years between arriving in the past to destroy the Kelvin and the events of Star Trek 2009. The events, when written out, are kind of amazing. I assure you this comic is actually very bad, an inert story with no emotional content comprised mainly of middling trace work of stills from Star Trek movies. Also Nero became psychic, his ship got Borg powers, he flew it to the V'Ger cloud in the Kelvinverse and communed with it but it was unable to subjug In this comic, you learn what Nero did in the 25 years between arriving in the past to destroy the Kelvin and the events of Star Trek 2009. The events, when written out, are kind of amazing. I assure you this comic is actually very bad, an inert story with no emotional content comprised mainly of middling trace work of stills from Star Trek movies. Loved the back story. The art not so much. Now this is what I would have wanted to see in the 2009 Star Trek movie. A solid background story for the villain to make him more understandable and whole as a character. Eric Bana would have had a field day with a story that gets under Nero’s skin and reveals his tragedy to the reader. This is dramatic but smart storytelling at its best, handling themes of loss and the drive for retribution boldly and with emotional charge. After reading this the movie feels so much better. Trek has by custom r Now this is what I would have wanted to see in the 2009 Star Trek movie. A solid background story for the villain to make him more understandable and whole as a character. Eric Bana would have had a field day with a story that gets under Nero’s skin and reveals his tragedy to the reader. I wanted to see some more of Nero's backstory, but between Countdown and this I got more than I wanted. In particular the sequence where (view spoiler)[the Nerada is activated by V'Ger and the crew then goes all the way out to meet V'Ger and back was unnecessary and forced just to link the new Trek universe to the events in the old Trek universe. (hide spoiler)] The art is decent, the story is okay, but just didn't engage me as much as I had hoped. Probably won't read again. Out of all the Trek Alternate Universe graphic novels I've read so far, this one was surprisingly the best. Plot wise, but most importantly, in the art. I'm always extremely disappointed in the art but this time I found myself stopping to admire it rather than hoping to skip past it quickly. Since this was the one book I was least expecting to enjoy, it was a very nice surprise! A much better and different in style comic than Countdown. I really recommend this, as it adds more backstory to the movie and character if Nero. Great drawing style (a bit too thick lines, but very accurate faces) with a very cinematic feel, only darker than the movie. In filling in Nero's background, and his route to hatred and self-destruction, this is first rate work. It's also very much superior to the film, where we get virtually none of this through the character presented...unless it's hiding somewhere behind JJ Abrams' lens flares. The surprise visit to a parallel V'Ger is the highlight of this story. 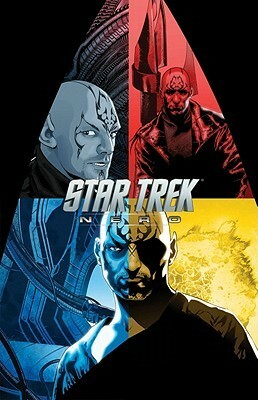 While this is the least of the three Star Trek 2009 prequel comics, it's still pretty good. Art is probably the best of the three, but it's still not all that stylish. There's some nice space scenes though. Definite read for the fans of the 2009 Star Trek fans. Answers major plot questions, such as why Nero just didn't go back to Romulus and say hey our star is going to blow up and why his mining ship is so insanely powerful. It's nicely written and fits in nicely with the film. Nice "fill in the blanks" story explaining just what Nero was up to during the 25 years between his arrival in the new Trek universe and his encounter with Kirk and the gang. Includes some fun homages to the pre-existing Trek universe as well. Filling in some blanks pre-movie - I like getting more of Nero's motivation. Well, it's Star Trek. So, that's cool. Huge discontinuity between some panels. Glad I got it for free at the HPL! Есть кое-какие шероховатости в переводе. some insight into the years Nero waited for Spock, just before the first movie of the new rebooted star trek universe. not as interesting as countdown, but still enjoyable. The prequel to the movie was okay. It didn't really add a lot to the story, in my opinion. Some of it seemed to be a big reach. Some additional insights into Nero's motivations. For example, why didn't he go back to Romulus when sent back in time? Also some additional info on his time at Rura Penthe.